Great for your guests and time management. When hosting a dinner gathering it is essential to be well prepared so you can spend time enjoy the occasion with your guests. Thanksgiving is the mother of all dinner parties. Do yourself a favor – as well as your guests and offer a tasty, seasonal punch. 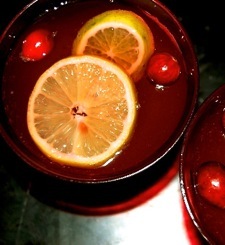 A fresh punch is a great way to take the pressure off of the host without compromising on originality and flavor.